Plato (428-27 - 348-47 BC) was a major Greek thinker in Ancient Philosophy, a student of Socrates, founder of the first Academy, and with his student Aristotle and the most important modern philosopher Kant, is still considered one of the singularly important thinkers of all time. Some thirty-five "Socratic" dialogues and thirteen letters have been ascribed to Plato, and like Aristotle's own dialogues which were lost, Plato's treatises, if any, were lost as well. As a result, the pedagogical use of his dialogues in the Academy he founded is still unclear. 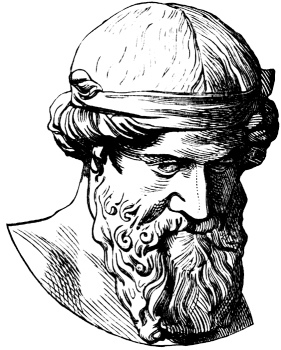 Plato emerged among a group of Greek, "pre-socratic" philosophers who focused on broad questions and elemental answers, to lay clear foundations in Philosophy, Mathematics, Science, Ethics and Politics, becoming the first to challenge conventions and establish questions surrounding nature of reality, scientific truths, morality, political power, and beauty. As medieval scholarship discovered the Ancients, Plato's influence was extended well into the Renaissance, and continues in Modern conceptions of Idealism and dualistic realms. Plato's dialogues are rich and powerful achievements, and are in use to the present day for classes in Philosophy, Language, Mathematics, Politics, and many other subjects. Diogenes Laertius wrote that Aristocles, named after his grandfather, had a wrestling coach, Ariston of Argos, who dubbed him "Platon", meaning "broad," due to his robust figure. Recent scholars dispute Diogenes' account, arguing the name "Aristocles" was merely a Hellenistic legend. Plato's actual birth date and place are unknown, he did belong to an aristocratic and influential family. Most modern scholars believe Plato was born in Athens or Aegina between 429 and 423 BC, to Father, Ariston and Mother, Perictione, along with Brothers, Adeimantus and Glaucon, and Sister, Potone, who gave birth to Speusippus (Plato's successor at the Academy). Plato referenced his distinguished relatives in his dialogues, often describing them with some precision: Charmides, Critias, Adeimantus and Glaucon all take prominent roles in The Republic, which if nothing else, suggests a considerable amount of family pride. Plato would have been instructed in Grammar, Music, and Gymnastics by the most distinguished teachers of his time, and Speusippus praised Plato's quickness of mind and modesty as a boy, saying the "first fruits of his youth infused with hard work and love of study". Plato may have wrestled at the Isthmian Games, attended courses of Philosophy, and met Socrates when becoming acquainted with Cratylus, Heraclitus. Plato may have traveled in Italy, Sicily, Egypt and Cyrene,and is said to have returned to Athens by age forty, then founding one of the earliest known organized schools in Western Civilization, on a plot of land in the Grove of Hecademus (Academus). Plato made clear in his Apology of Socrates that he had been one of Socrates' most devoted young followers. In that dialogue, Socrates mentioned Plato by name as one of those youths close enough to him to have been corrupted, that is, if he had been guilty of "corrupting the youth". Plato is mentioned along with Crito, Critobolus, and Apollodorus, and offered to pay the fine on Socrates' behalf, in lieu of the Death Penalty proposed by Meletus. In the Phaedo, the title character lists those who attended Socrates' last day, explaining Plato's absence with "Plato was ill". In fact, the relationship between Plato and Socrates is problematic, and even Aristotle attributed a different doctrine of Ideas to Socrates and Plato in his Metaphysics, but Plato never spoke in his own voice in his dialogues. In the Second Letter, he wrote "no writing of Plato exists or ever will exist, but those now said to be his are those of a Socrates become beautiful and new." Xenophon and Aristophanes presented a still different portrait of Socrates from Plato, and many have noted the problem of taking Plato's version of Socrates literally, especially given Socrates' reputation for irony. In the Theaetetus, Socrates took a disciple, a young man whose inheritance had been squandered. Socrates twice compared the relationship of the older man and his boy lover to a Father-Son relationship (Lysis, Republic), and in the Phaedo, Socrates' disciples say they will feel "fatherless" when he is gone. Thus, the man-boy love can be seen as code for Father-Son bond. In several dialogues, Plato (via his "character", Socrates) expounded the idea of Knowledge being a Recollection, rather than a Learning, Observation, or Study. Plato maintained this view despite of Socrates' jokes of forgetfulness, or perhaps as ironic twists. Socrates is often described as arguing our Knowledge is not "empirical", that it comes from Divine Insight. Consistent in believing in the Immortality of the Soul, several of the dialogues end with long speeches describing the Afterlife. More than one contrasts Knowledge and Opinion, Perception and Reality, Nature and Custom, Body and Soul (except Parmenides) - which points to the inherent Dualism of Ideal Forms versus mere copies or mimics in Nature. The idea is given illustration in dialogues discussing Art. Poetry, for Plato, is inspired by the Muses, not a rational, ideal. Although Plato seemed to approve seeming madness, whether drunkenness, eroticism, or dreaming, in the Phaedrus and the Republic Plato suggests outlawing Homer's poetry, even laughter. In the Ion, Socrates there is no hint of the disapproval of Homer expressed in the Republic, suggesting there that Homer's Iliad functioned in the ancient Greek world as divinely inspired Literature and moral guidance. Politics and Art, Religion and Science, Justice and Medicine, Virtue and Vice, Crime and Punishment, Pleasure and Pain, Rhetoric and Rhapsody, Human Nature and Sexuality, Love and Wisdom, are all subjects on which Socratic "dialectic" opened up new understanding. In several dialogues, most notably the Republic, Plato inverted the common intuition about what is "knowable" and what is "real". We often take the objects of the senses as real, but Plato questioned if something had to be graspable in the hands to be "real". He who sees with his eyes is blind, Plato said, an idea famously captured in the Republic Myth of the Cave and Myth of the Sun, and the Divided Line. In these interpretations, the invisible world is the most intelligible ("noeton") and the visible world ("horaton") the least knowable, the most obscure. The sun-lit world of the senses, in other words, is not "The Good" or "The Real", and are merely signs of ignorance. Few climb out of the "cave" of ignorance, and of those who do, most have not only a terrible struggle to attain clarity, but when they go back "down" to help others up, they find themselves objects of scorn and ridicule - something today's philosophers see as all too allegorical. Physical objects and events are mere "shadows" of their ideal or perfect forms, like the shadows on the cave's walls, and exist only to the extent they "instantiate" perfect versions of the forms. Plato's "metaphysics", then, is understood as this division of reality into the irreconcilable realms of the material and the ideal. Such "dualism" has been an endless influence on Western philosophical and religious ideas to the current day. Plato's Theory of Forms address the Problem of Universals, or the question of the connection between the perfect ideal and the imperfect copy. The Forms are archetypes, abstract representations of the many types and properties of things. Plato's view of Knowledge seems to be "justified true belief", a view which informed future developments in modern "analytic"-style Epistemology. In the Theaetetus, Plato argued that Belief can be distinguished from Knowledge on the account of Justification. Edmund Gettier famously, and more recently, demonstrated the problems of "justified true belief" as an account of Knowledge (thus igniting the analytic tradition). Plato associated Knowledge with the apprehension of unchanging Forms, and with their relationships to one another, which he called "expertise", or "dialectic". Knowledge is always proportionate to the realm from which it is gained, and so, if we derive an account of something through experience, and because the world of our senses is in flux, those views will be mere opinions, lacking necessity or stability. On the other hand, deriving an account of something through the non-sensible, ideal forms, and because these forms are unchanging, so too is the account. Uncovering these accounts is the "recollection" Plato spoke about. The Myth of the Cave is intimately connected to Plato's political science, in that only those people who have climbed out of the cave to cast their eyes upon a vision of goodness are fit to rule. The enlightened men of society must be forced from their common contemplations and compelled to run the ideal city (Atlantis) according to these lofty insights, which is what Plato meant by the "philosopher-king", a wise leader who accepts the power (and light) thrust upon him by the people who are wise enough in turn to choose a good master. Societies have a tripartite class structure, corresponding to the Tripartite Soul (appetite, spirit, reason), such that we have: Workers (represented by the abdomen, the appetite), the labourers, and skilled craftspeople; Warriors (represented by the chest, spirit), the adventurous, strong and brave; and the Philosopher-Kings (represented by the head, reason), those who are intelligent, rational, self-controlled, and in love with wisdom. Philosopher-Kings love "the sight of truth", and the Republic addresses how an educational system should be set up in order to produce such rulers. The ideal city, the luxurious city, is the "true" and "healthy" society containing farmers, craftsmen, merchants, and wage-earners, but lacking the over-used delicacies, such as perfumed oils, incense, prostitutes, pastries, paintings, gold, ivory, couches, or a multitude of occupations such as poets and hunters. The Ideal City of Light (Atlantis, in myth form) is used as an image to illuminate the Soul, the Reason, and combined with the training of the human body. Wisdom is Knowledge about the Good in all that exists. Aristotle, Metaphysics. See original text in Perseus program''. WIKISOURCE, Charmides, Plato, . See original text in Perseus program. WIKISOURCE, Gorgias, Plato, . See original text in Perseus program. WIKISOURCE, The Republic, Plato, . See original text in Perseus program. WIKISOURCE, History of the Peloponnesian War, Thucydides, , V, VIII. See original text in Perseus program. weblink" title="web.archive.org/web/20080126175146weblink">Online library "Vox Philosophiae"
Some content adapted from the Pseudopedia article "Plato" under the GNU Free Documentation License.